This hybrid beardtongue forms a low clump of thick, glossy green foliage. Upright flower stems appear in mid-spring and carry spikes of bright red tubular flowers into early fall. Red Riding Hood is a good low-maintenance perennial, especially for hot, dry sites. Unlicensed propagation of this plant is prohibited as it has USPP (US Plant Patent) #18950. There are over 200 species of penstemons, commonly called beard-tongues, that are native to North America. They display a wide variety of growth habits and flower colors and occupy a broad range of habitats from open desert to alpine zones and moist forests. Since the early nineteenth century, plant breeders have created hundreds of penstemon hybrids. Red Riding Hood is one of seven colors in the Riding Hood series and was the first to be introduced in 2001 by Dutch plant breeders Molter BV. The other six colors were introduced in 2010 and are blue, delft blue, hot pink, lavender, marble-cream and purple. The goal of the Riding Hood series was to breed plants with excellent winter hardiness, a compact growth habit, a longer flowering season and numerous showy flowers. Red Riding Hood forms a low clump of thick, glossy green foliage that, in time, grows to about 2-3' wide. In mid-spring, upright flower stems appear, each one topped with a spike of bright red tubular flowers that bloom all summer long and into early fall. In bloom, plants grow to around 2' tall. Plant Red Riding Hood in a sunny spot where it'll get at least half a day of sun. Red Riding Hood is tolerant of most soil types, including clay. It won't survive, though, in a soil that's completely waterlogged for prolonged periods of time. On the coast and once it's established (one year), Red Riding Hood will survive without any supplemental water in the summer. However, try not to let the soil become bone dry as the leaves don't recover well once they've wilted. If there was below average rainfall in the winter, it will probably need some extra water. Not watering plants in the summer will shorten the blooming period and the foliage will start to shrivel. Even in cooler coastal climates, Red Riding Hood will definitely perform better with an occasional deep watering, if possible, in the summer. In hotter inland areas, Red Riding Hood will benefit from an occasional deep watering in the summer. Red Riding Hood doesn't usually suffer from any pests or diseases. If it's planted in too much shade, you might notice some powdery mildew on the foliage if the spring or summer weather's particularly humid. 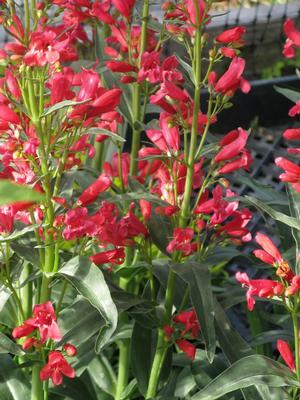 Although not a California native, Red Riding Hood penstemon fits well in a garden planted predominantly with natives. It also works well in containers and makes a good cut flower. Red Riding Hood looks good incorporated in large scale meadows to provide a splash of color. Regular deadheading (cutting off spent blooms) will prolong the blooming season.